This was a good night. A really good night. Johanna LOVES to eat. With her fingers. Exactly what we are eating. While yanking off her bib. Again, this was a good day. Only a few small paint stains? Bravo! Hip hip hooray! For the longest time, I was just losing it over the daily clothing massacre that was occurring in our household. It felt so needless, so wasteful, yet I seemed to be powerless to put an end to it. I’ve been using natural stain removers for a long time, and I was coming to grips with the fact that they just didn’t seem to cut it. Oh yes, I carefully sorted through the dirty clothes, pre-treated everything while I got my piles of laundry ready to go and my washer filled up. It didn’t matter, though. Inevitably there was at least one permanent stain left behind for all of the others that came out each time I did laundry. I wasn’t willing to switch to something stronger and more chemical-filled. I also couldn’t afford to keep replacing my children’s clothing. This little spray bottle became the answer to my dilemma. I’ve also made this work using my homemade stain remover, but I’ve decided that ultimately the Bac-Out works just a little better and is just as cost-effective because I buy it when it goes on sale and I water it down by half. My line of thinking is this: When you use chemical stain removers (like Shout or similar) you can usually just apply them 5 minutes before you wash, giving them a good spray or scrub, etc. These powerful removers can work quickly like that. Natural stain removers don’t work like that. They need time to work and they need to be applied right away. I was initially concerned about using an enzyme-cleaner like Bac-Out and leaving it sitting on our clothes for possibly days before I got around to washing them. It hasn’t been a problem. 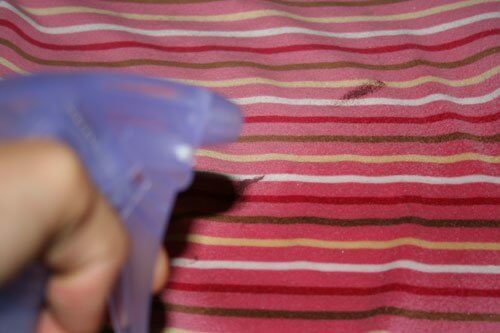 I have not noticed any marks or wearing out of clothes in places where I have sprayed them and let them sit. Here’s me spraying Abbie’s paint-adorned shirt tonight, up in our family closet, where we keep everyone’s clothes together (look for an upcoming video of how we’ve organized our family closet!). Nothing dirty is allowed to go into the hamper without being looked over and sprayed first. That’s my new rule. Then they sit as long as they sit. Half a day, 5 days, it doesn’t seem to really make a difference. When I do actually focus my aim and pre-treat all stains immediately when clothes come off (or even immediately after the stain occurs, if I catch it that fast), something miraculous happens in the wash. Even in the cold water, natural detergent wash.
Stains come out! Hallelujah, jubilee! It works for me, it will work for you, too. 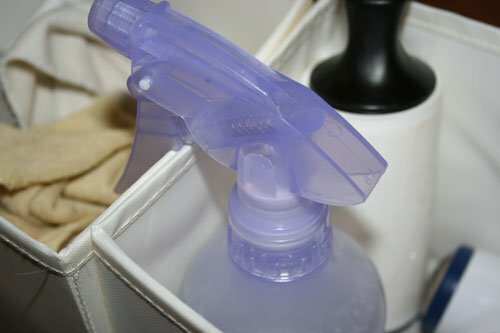 Get thee to a dollar store, get as many bottles as you have bedrooms, fill them with Bac-Out (or your favorite natural stain remover) and spray away. Soon you will be singing “oh happy day” along with me. How do YOU ensure that stains come out of your children’s clothes, without using strong chemicals, and without taking a lot of time and effort to get them out? 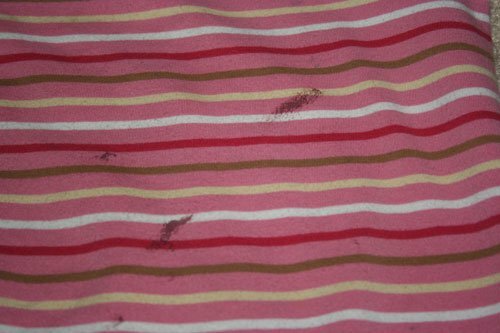 Okay, I have been fighting a losing battle with stains on my kids clothing recently too. I’ve tried all different types of natural stain removers and like you said, sometimes they work great, but other times, for whatever reason, the stain just doesn’t come out. Bac-out has been on my list of things to buy the next time I place an online order, because I haven’t been able to find it in stores around here, and I have been thinking that maybe I need to pre-treat stains right away to have a higher chance of the stains being removed. You have just given me the kick I need to do both!! my kids just wore stained clothes! Nowadays, with older kids (youngest is 7) and less stains I use my homemade soap for all our stains. I want to try some of the ideas that were on that chart contributor guest post a while back but for most everything my homemade soap works fabulously. I just hand scrub it, even after the laundy has been sitting for a few days with great success. 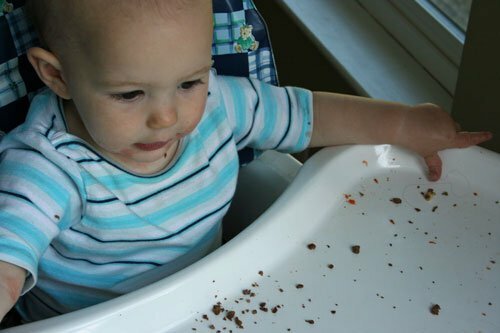 Another idea for little ones is to just strip off their shirts while eating. My sis-in-law did this for years. no clothes, no stains! Aaaakkk! I have been losing the battle lately w/stains. Just yesterday I washed my toddler’s shirt that he’d gotten pen ink all over (I forgot to even spray anything on it…not that what I’ve been spraying would have worked anyway) and there were the stains still when I was folding it. Of course kicking myself ensued. This post is just in time to save my hiney any more pain (and my kids’ shirts any more carnage) – I need to try something better than what I’ve been using….where o WHERE can I get this Bac-Out stuff??? @Amy, I buy mine from Azure Standard, but most health food stores carry it as well. I’ve been soaking stained clothes in a large bowl of cold water with natural oxygen powder. I let them soak for 2-3 days, then wash and hang in the sun. This works great, and it’s amazing for old stains, even on clothes that have been put in the dryer stained. A friend gave me a ton of adorable, pricey baby clothes and some of them had spit-up or other stains, but the oxy-soak method took them all out. I would like something that didn’t require a giant bowl of soaking clothes in my kitchen though, and Bac-out was also recommended for soaking mama cloth, so I guess I’ll finally break down and get some. 🙂 Thanks for the tip! I have a spray bottle of distilled white vinegar that I use. 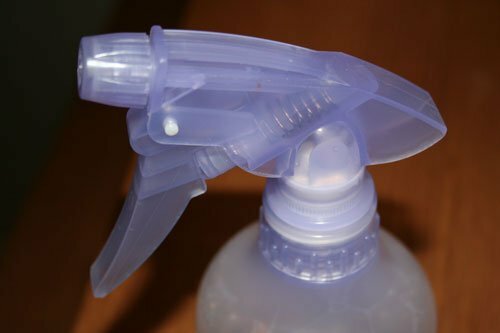 I keep it in the laundry room and I just spray when I see a stain (as soon as they happen, if I catch them in the moment) We mostly wear cotton and this seems to work on pretty much everything – though it hasn’t worked on ink, sharpie marker, or grass stains. But, then again, I don’t know of too many chemical things that work on those either. Love the idea of having small spray bottles in strategic spots. Great tip! Stephanie, thanks so much for sharing this! I had thought that I had to just deal with stains on some clothes since I didn’t want to use toxic stain removers any more, but I’m going to give this a try! I do have separate ‘play’ and ‘nice’ clothes for the kids, and I’m a little more careful about what they eat/play when they’re in nicer clothes, that’s cut back on the stains a little bit. But life happens too! @Pam Howard, It’s the “Bac-Out Stain Remover and Odor Eliminator”. It’s sort of the basic, standard Bac-Out. We love Bac-out! But, if you want to avoid the work of getting out stains, try wearing “aprons” at meal times. My cousin does this with her 10 yo daughter. Now her daughter even suggests it when mom forgets. @Monica, What a great idea! My 19 month old doesn’t like bibs but LOVES her apron!!! 1) Which bac-out did you use? The like had several types listed. @Holly, I used the basic Bac-Out Stain Remover. I have used it on khaki clothes and I haven’t noticed any fading, at least not yet. Where can you buy Bac-out? I may give it a whirl. @Erin, I saw it at our Kroger actually. For stubborn stains and heat set grease stains that you miss and then run through the dryer “Aargh” –I use Citra Solve concentrate. it is an orange based cleaner sold in most health food stores. One drop of this stuff is all it takes and i can do it right before the clothes go in the dryer. I am notorious for splattering my clothing with oil while making dinner and this stuff takes it right out. I don’t dilute it at all. I just take a little bottle and stick a pinhole in it so that I can drip it where it needs to go. It takes out blood, oil, and most organic stains. It also will get rid of sticker residue that has been cooked into a shirt that was washed with the name tag on. 🙂 It also makes your laundry smell like fresh oranges. I’ve been using this same “remedy” for stains for the past couple of years. It’s great! Lately, I’ve just been getting their concentrated “All-Purpose” cleaner, since it’s often easier to find (and on sale) more than the Bac-Out, and it works great, too. I get mine from Azure Standard. @Michele @ Frugal Granola, Oh, does it work well with their all-purpose? I use that for my regular cleaning, but have never tried it on stains! What ratio do you use it in? Thanks for this post! I have not been too thrilled with the homemade stain remover, but maybe not letting it sit long enough was part of the problem too. I would never admit this, but I have been known to lecture my husband on the necessity of bibs on my 1-year-old and cringe slightly whenever my boys get really “into” their crafts or playing outside. I was just telling my husband the other day, while folding laundry, how hard I work to find inexpensive clothing and how I don’t have the time or the money to keep buying new things. Thank you so much. We LOVE Bac-Out around here! Thank you for taking time to post this practical tip! I have been searching for a better method for treating stains. I love the simplicity of this. THANK YOU! I have been in analysis paralysis for a couple weeks after my last bottle of Resolve ran out and I couldn’t bring myself to purchase another chemical-filled stain remover. Now I know exactly what to do to rid my house of stained clothing. And it’s not just children’s clothes around here — my toddler’s favorite sign of affection is to bury her face into my shoulder, and the more messy the face the more likely she is to do it! I love the humor and practical advice in this post! I can’t remember the last time my daughter did not stain her clothes in a days time. One more baby step towards a more natural home. I think I am making progress! Thanks for the help in that direction. Good to know! I have Bac-Out which I have used for getting stinks out of cloth diapers. Have used it on carpet stains too but hadn’t thought to put it on as an early pre-treatment for clothes. I’ll definitely be trying it…have been having stain issues as well. Oh, and I originally bought mine at Whole Foods but have seen it at my local grocer, Kroger, for a good price too which is much more convenient for us. Thank you for sharing! I will have to try this, although I don’t know where I would find Biokleen where I live. I’ve also tried other natural stain removers with NO results (not even any stain removal at all). So…I’ve also felt this frustration. I asked a lot of people for advice (people who live more naturally) and finally came up with something that works for us. I love that both my methods also seem to work on OLD stains, even ones that are set in by the dryer! I use two things. One is powdered “Safe Bleach” by Soap works also known as powdered hydrogen peroxide (mine also has washing soda in it, since it was the best deal, but I’ve also tried Ecover’s powdered non chlorine “bleach” and nature clean’s and they work similarly). I put a container with as hot water as I can get away with and sprinkle in about 2 teaspoons of the powdered safe bleach. Then about the same of my regular natural laundry detergent. Then I swish to dissolve. Then I add the stained item, making sure its immersed the stain well. It usually takes a few hours, but sometimes I have to change the water and try it again. 99% of the time I don’t do it twice, and mostly, it sits there about a day until I go back to it, the stain is gone. It does NOT work with grease stains though. For grease stains (I really don’t know where they come from at our house. I noticed throw up, once washed and dried, leaves a grease stain, as does breast milk. But we (mainly me, maybe its the breast milk) get this daily). I use dish soap, or I use Dr Bronner’s Sal Suds. I did notice that Sal Suds contain SLS (after I bought it) which really surprised me, but they do mention they believe its safe in this way…I don’t know. I’ll go back to just dish soap and see when this bottle is finished. Oh I also wanted to know, I’ve noticed online here and there people using this same Bac-out for stinkies in cloth diapers. Is it safe for all cloth diapers, fleece, PUL etc? How do people use it? Does it last de-stinked? I have occasional issues with my cloth diapers…but its wierd since its not consistent. @Nola, Biokleen is harder to find in Canada. You might have to order it online if you really want it. Or possibly call around to health food stores in the big city next time you visit? Would you recommend spraying your clothes ahead of time with your homemade stain remover or just prior to washing. I looked at your recipe for that and would also like to try that one out. @Gretchen, Spray ahead of time. The homemade one definitely doesn’t hurt clothes when it sits on them for a while (at least, not in my experience). Oh my goodness! This might be the best post yet – I hate seeing ruined clothes, but my daughter is a messy eater, a rough and tough player and a budding artist. Stains happen ALL-THE-TIME and I feel helpless… The natural stuff doesn’t cut it and I refuse to use chemicals – so, Thank you! Thank you! Thank you!! I’ve tried Bac-out before but I have actually found that Hydrogen Peroxide works the best for me and it’s not as expensive. I’am not sure if you consider that a chemical or not but I do know that Sally Fallon in Nourishing Traditions says you can use it on your veggies to clean them so it can’t be that bad right? I’m sooo trying that for my four little messies! Oh, and how do you use Bac Out for cloth diaper stinkies? Like still smelling some poop kind of stinkies. I’m having that issue all the time lately. I’ve tried stripping and changing detergents and natural soaps and everything. Water softener, you name it. I have moderately hard well water and a front loader. Any advice? A year ago I started using pocket diapers when before I’d only had cotton prefolds and Bummis covers. Don’t remember having major stink issues with those. @Jodi, I do use it for diapers a bit. I’m actually trying out Rockin’ Green right now (review coming up in September), which is supposed to be really useful for stink. @Stephanie @ Keeper of the Home, I’m looking forward to that review! Are you having stinkies issues, too? Do you use a front loader? Oh, and where and how much do you use the Bac Out in the washing cycle? @Jodi, I do have stink issues with my diapers, but it’s minor. I If I use Bac-Out in the diaper wash (which I don’t very often) it’s maybe 1/4 cup (I don’t measure) in the first cold wash, so that they get rinsed really thoroughly in the hot wash after I use it. So, is bac-out all natural? @Ashley at Bosssanders.com, Yes, Bac-Out is natural. So sad about the new clothes… I hate when that happens! Please, does anyone know how I can substitute Bac-Out or get something similar here?? Thanks!! I picked up Bac-Out this weekend from Whole Foods, looking forward to testing it out on ALL of our clothes. Our daughter manages to get stains on both hers, my husbands, and my clothes too! Great idea! My friend and I have a laundry service from our homes. We normally try to use a white vinegar mixture on stains. I think I’ll try this out at my house and maybe start using it on client clothes as well. I love the idea of having a bottle near each laundry basket! Thanks for sharing. Can you tell me more details about your stain remover? When I go to the product page, there are several types of products. Can you narrow it down? Thank you! I had never heard of this. I picked it up yesterday at WF. The old stain on one of my favorite camisols is almost gone. Another few hours of soaking and I’ll be able to wear it again! Which bac out product is used for the stain remover?